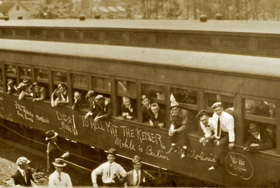 The outbreak of World War I in July 1914 brought many changes to the lives of Alabamians, even though the United States would not join the fighting until April 1917. Cotton prices and production dropped quickly with disruptions in shipping and shifts in industrial efforts overseas away from textiles, and a ramping up of the military industry in the northern and midwestern United States sparked what would become a mass movement of African American labor out of the South in what became known as the Great Migration. In all, some 86,000 Alabamians, both black and white, fought, and more than 2,500 died in the effort. Alabama native Osmond Kelly Ingram (1887-1917) was the first U.S. Navy enlisted man killed during World War I.